Nationwide, graduations are an opportunity to reflect and savor accomplishments and to brightly anticipate the future. One Catholic school in Chadd’s Ford, Pa., in the spirit of preparing and protecting their graduating students, went a more macabre route: gifting eighth-graders with bulletproof inserts to help keep them safe in the event of a school shooter. According to NBC News, the removable ballistic shields given to St. Cornelius Catholic School students could turn their backpacks into bulletproof vests. The vests are the result of a request St. Cornelius Principal Barbara Rosini made to Unequal Technologies, a company that specializes in ballistic armor. 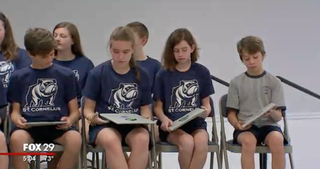 Unequal Technologies CEO Robert Vito donated the bulletproof shields to the graduating class, along with 25 additional plates that were given to school faculty. As WTXF-TV reports, Vito’s daughter attends St. Cornelius. But the shield could offer a false—and dangerous—sense of comfort. The school seems to have taken Vito at his word, despite warnings from body-armor experts that items like inserts or bulletproof backpacks are limited in their ability to protect against an active shooter. Aaron Westrick, an armor expert with the Ballistic Armor Research Group, told ABC News earlier this year that “soft body armor” like the insert offered to the Pennsylvania eighth-graders won’t stop bullets from assault weapons or rifles—the weapons of choice for mass shooters. “The chances of a ballistic backpack coming into play during an attack or saving a child from injury are slim,” Westrick said, adding that for a backpack to withstand assault weapon fire, it would need to be built of steel or titanium.